IAQ can be affected by gases (including carbon monoxide, radon, volatile organic compounds), particulates, microbial contaminants ( mold, bacteria), or any mass or energy stressor that can induce adverse health conditions. Source control, filtration and the use of ventilation to dilute contaminants are the primary methods for improving indoor air quality in most buildings. Residential units can further improve indoor air quality by routine cleaning of carpets and area rugs. Radon is an invisible, radioactive atomic gas that results from the radioactive decay of radium, which may be found in rock formations beneath buildings or in certain building materials themselves. Radon is probably the most pervasive serious hazard for indoor air in the United States and Europe, and is probably responsible for tens of thousands of deaths from lung cancer each year. There are relatively simple test kits for do-it-yourself radon gas testing, but if a home is for sale the testing must be done by a licensed person in some U.S. states. Radon gas enters buildings as a soil gas and is a heavy gas and thus will tend to accumulate at the lowest level. Radon may also be introduced into a building through drinking water particularly from bathroom showers. Building materials can be a rare source of radon, but little testing is carried out for stone, rock or tile products brought into building sites; radon accumulation is greatest for well insulated homes. The half life for radon is 3.8 days, indicating that once the source is removed, the hazard will be greatly reduced within a few weeks. Radon mitigation methods include sealing concrete slab floors, basement foundations, water drainage systems, or by increasing ventilation. They are usually cost effective and can greatly reduce or even eliminate the contamination and the associated health risks. These biological chemicals can arise from a host of means, but there are two common classes: (a) moisture induced growth of mold colonies and (b) natural substances released into the air such as animal dander and plant pollen. Mold is always associated with moisture,  and its growth can be inhibited by keeping humidity levels below 50%. Moisture buildup inside buildings may arise from water penetrating compromised areas of the building envelope or skin, from plumbing leaks, from condensation due to improper ventilation, or from ground moisture penetrating a building part. Even something as simple as drying clothes indoors on radiators can increase the risk of exposure to (amongst other things) Aspergillus - a highly dangerous mould that can be fatal for asthma sufferers and the elderly. In areas where cellulosic materials (paper and wood, including drywall) become moist and fail to dry within 48 hours, mold mildew can propagate and release allergenic spores into the air. Several initiatives envisage to reduce indoor air contamination by limiting VOC emissions from products. There are regulations in France and in Germany, and numerous voluntary ecolabels and rating systems containing low VOC emissions criteria such as EMICODE,  M1,  Blue Angel  and Indoor Air Comfort  in Europe, as well as California Standard CDPH Section 01350  and several others in the USA. These initiatives changed the marketplace where an increasing number of low-emitting products has become available during the last decades. "There are approximately ten times as many bacterial cells in the human flora as there are human cells in the body, with large numbers of bacteria on the skin and as gut flora." A large fraction of the bacteria found in indoor air and dust are shed from humans. Among the most important bacteria known to occur in indoor air are Mycobacterium tuberculosis, Staphylococcus aureus, Streptococcus pneumoniae. Carbon dioxide (CO2) is a relatively easy to measure surrogate for indoor pollutants emitted by humans, and correlates with human metabolic activity. Carbon dioxide at levels that are unusually high indoors may cause occupants to grow drowsy, to get headaches, or to function at lower activity levels. 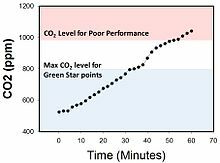 Outdoor CO2 levels are usually 350-450 ppm whereas the maximum indoor CO2 level considered acceptable is 1000 ppm. Humans are the main indoor source of carbon dioxide in most buildings. Indoor CO2 levels are an indicator of the adequacy of outdoor air ventilation relative to indoor occupant density and metabolic activity. Houseplants together with the medium in which they are grown can reduce components of indoor air pollution, particularly volatile organic compounds (VOC) such as benzene, toluene, and xylene. Plants remove CO2 and release oxygen and water, although the quantitative impact for house plants is small. Most of the effect is attributed to the growing medium alone, but even this effect has finite limits associated with the type and quantity of medium and the flow of air through the medium. The effect of house plants on VOC concentrations was investigated in one study, done in a static chamber, by NASA for possible use in space colonies. The results showed that the removal of the challenge chemicals was roughly equivalent to that provided by the ventilation that occurred in a very energy efficient dwelling with a very low ventilation rate, an air exchange rate of about 1/10 per hour. Therefore, air leakage in most homes, and in non-residential buildings too, will generally remove the chemicals faster than the researchers reported for the plants tested by NASA. The most effective household plants reportedly included aloe vera, English ivy, and Boston fern for removing chemicals and biological compounds. When carbon dioxide concentrations are elevated indoors relative to outdoor concentrations, it is only an indicator that ventilation is inadequate to remove metabolic products associated with human occupancy. Plants require carbon dioxide to grow and release oxygen when they consume carbon dioxide. A study published in the journal Environmental Science & Technology considered uptake rates of ketones and aldehydes by the peace lily (Spathiphyllum clevelandii) and golden pothos (Epipremnum aureum) Akira Tani and C. Nicholas Hewitt found "Longer-term fumigation results revealed that the total uptake amounts were 30−100 times as much as the amounts dissolved in the leaf, suggesting that volatile organic carbons are metabolized in the leaf and/or translocated through the petiole." It is worth noting the researchers sealed the plants in Teflon bags. "No VOC loss was detected from the bag when the plants were absent. However, when the plants were in the bag, the levels of aldehydes and ketones both decreased slowly but continuously, indicating removal by the plants." Studies done in sealed bags do not faithfully reproduce the conditions in the indoor environments of interest. Dynamic conditions with outdoor air ventilation and the processes related to the surfaces of the building itself and its contents as well as the occupants need to be studied. While results do indicate house plants may be effective at removing some VOCs from air supplies, a review of studies between 1989 and 2006 on the performance of houseplants as air cleaners, presented at the Healthy Buildings 2009 conference in Syracuse, New York, concluded "...indoor plants have little, if any, benefit for removing indoor air of VOC in residential and commercial buildings." This conclusion was based on a trial involving an unknown quantity of indoor plants kept in an uncontrolled ventilated air environment of an arbitrary office building in Arlington, Virginia. The use of air filters can trap some of the air pollutants. The Department of Energy's Energy Efficiency and Renewable Energy section suggests that "[Air] Filtration should have a Minimum Efficiency Reporting Value (MERV) of 13 as determined by ASHRAE 52.2-1999. "[ citation needed] Air filters are used to reduce the amount of dust that reaches the wet coils. Dust can serve as food to grow molds on the wet coils and ducts and can reduce the efficiency of the coils. ^ Ezzati M, Kammen DM (November 2002). "The health impacts of exposure to indoor air pollution from solid fuels in developing countries: knowledge, gaps, and data needs". Environ. Health Perspect. 110 (11): 1057–68. doi: 10.1289/ehp.021101057. PMC 1241060. PMID 12417475. ^ Logue, J. M.; McKone, T. E.; Sherman, M. H.; Singer, B. C. (1 April 2011). "Hazard assessment of chemical air contaminants measured in residences". Indoor Air. 21 (2): 92–109. doi: 10.1111/j.1600-0668.2010.00683.x. PMID 21392118. ^ Meruva NK, Penn JM, Farthing DE (November 2004). "Rapid identification of microbial VOCs from tobacco molds using closed-loop stripping and gas chromatography/time-of-flight mass spectrometry". J Ind Microbiol Biotechnol. 31 (10): 482–8. doi: 10.1007/s10295-004-0175-0. PMID 15517467. ^ Sears, CL (2005). "A dynamic partnership: celebrating our gut flora". Anaerobe. 11 (5): 247–51. doi: 10.1016/j.anaerobe.2005.05.001. PMID 16701579. ^ Allen, Joseph G.; MacNaughton, Piers; Satish, Usha; Santanam, Suresh; Vallarino, Jose; Spengler, John D. (2015). "Associations of Cognitive Function Scores with Carbon Dioxide, Ventilation, and Volatile Organic Compound Exposures in Office Workers: A Controlled Exposure Study of Green and Conventional Office Environments". Environmental Health Perspectives. 124 (6): 805–12. doi: 10.1289/ehp.1510037. PMC 4892924. PMID 26502459.